Need An Idea For A New Years Resolution? Try Going Green. How to offset all of your electric consumption with 100% wind power and go Green for 2016. New Year’s resolutions typically require a plethora of commitment and effort. Personally, I like to have two or three, admitting that I will barely accomplish one. This year, as a suggestion, what about making the commitment to reducing your carbon footprint while actually paying less for the electricity you consume? Whoa, hold on snake-oil salesman… what’s the catch? An average household consuming 10,000kWh/annually in electricity will generate an estimated 20,000lbs of CO2 per year. That number only takes into account your home electric usage – omitting the vehicles you drive, the businesses you patronize, and other misc. behaviors that contribute to CO2 emissions. I know, it sounds too good to be true. But with energy deregulation in states like Connecticut, all residents have a choice in who supplies their electricity. Town Square is a retail electric supplier that offers these types of electric plans as alternatives to the usual utility rates. 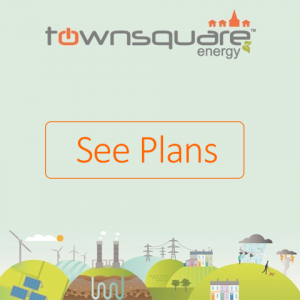 In addition to alternative electric rates, Town Square Energy has electric plans that offset all of your electric usage with 100% wind power by enrolling in a Green energy plan. Simply call (1-877-430-0093) or enroll online and Town Square alerts the utility of your new rate and plan. You then offset literally thousands of pounds of CO2 from making its way into the environment. No Enrollment Fees+No Cancel Fees=New Year’s Resolution in the bag. I wish I could make this sounds less “salesy” however, the truth of the matter is that we, at Town Square Energy, believe in Green and renewable energy sources. This is why we are offering our Green energy plans to the state of Connecticut for less than the current utility rate with no enrollment or cancellation fees. Anyone currently paying an electric bill can join and make an impact. Make 2016 a year that reduces your environmental effect to create cleaner and more pleasant years for generations to come.